Eric Schmidt joined Google as CEO in 2001 and led the tech company for the next decade as the company grew from a start-up to a corporate behemoth, whose parent company, Alphabet, now has a market cap of over $740 billion. Very early hiring strategies largely involved hiring co-founders Larry Page and Sergey Brin’s friends from Stanford University. Have you ever considered adding a Job Specific Apply Process? Your typical apply process for applicants may be for them to complete your (long) application form on your company website. People of any age can’t resist a good story, whether it’s the fairy-tale movies of our youth, sagas about wizard boys or Netflix binging. Stories make for wonderful entertainment — but they’re also an effective way to show potential candidates why they should work for your company. You’re interviewing a strong candidate and the conversation is coming to an end. You’ve talked about their current role, skills and career goals. You wrap up by asking, “What questions do you have for me?” Without a pause, the candidate asks, “Can you tell me how your company supports a diverse and inclusive culture?” This is not a question you were expecting. A few years ago, it wasn’t uncommon for managers to bring people in for multiple interviews over multiple days. It was also common for managers to drag out the hiring process. It made candidates’ lives stressful–never quite knowing if this interview was the final one or not. And even after going through all of this, you might well get ghosted–that is, neither the recruiter nor hiring manager would ever get back to you to tell you that you weren’t hired. Learn about the ten Work Opportunity Tax Credit Target Groups in this slide share from Cost Management Services. WOTC is a federal Tax Credit for businesses who hire individuals who fall under one of these target groups that include veterans. I am hiring lots of seasonal help this year to help with holiday sales. At CMS, as Work Opportunity Tax Credit (WOTC) experts and service providers since 1997, we receive a lot of questions via our website. With options for Express, Professional and Enterprise, you can find a flexible recruiting and onboarding solution that works for your budget, and meets your needs. 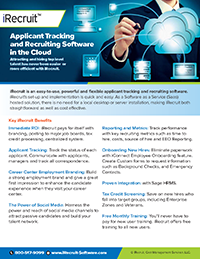 Follow iRecruit on Twitter, Facebook, and LinkedIn. This entry was posted in Blog, iRecruit Blog and tagged Recruiting News Roundup #FridayReads. Bookmark the permalink. #ThrowbackThursday Happy Easter from CMS iRecruit! Can I Reassign an iConnect Form/Document? Not ready to sign up or do a demo yet? Join our newsletter to keep in touch.